The Rev. 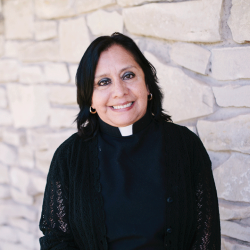 María del Rayo Jiménez Victoria was ordained to the priesthood with her husband, Rev. Elias Rosales Méndez, ten years ago. She now serves in the congregation Jesús es la Resurrectión in the city of Aguascalientes, Mexico. She has a passion for creating small group Bible studies in local homes.